(This entry is an expanded version of what was posted on June 4). This recession is a great time to be an entrepreneur, said Larry Chaityn, chapter president of an angel group (Keiretsu Forum NY Tri-State) because investors need somewhere to put their money. So many were eager to hear that message that the Forrestal Marriott had to set up extra tables for the New Jersey Entrepreneur Network meeting yesterday. Eighty people registered and another 2 dozen paid at the door for “A Gathering of Angels,” a round table with 7 angel funding groups. It took about 45 minutes for each and every one of the attendees to introduce themselves, and, for me, that was really the best part of the program. Such variety. Such inspiring stories, delivered in the 10 seconds allowed for each person. It was a good mix between entrepreneurs seeking funding (in some cases, seeking employees), investors seeking opportunities, and professional providers seeking clients. Just two of the stories for now. I was thrilled to meet Daniel Kogan, CEO of Health World Web in Manhattan. He was standing around looking lonesome and my motherly instincts kicked in. A short chat about what he does in the e-health area (social networks for patient communities) and then, hmm, I thought, this is right down Esther Dyson’s alley. So I made a pitch for July 9, when the Princeton Chamber has inveigled Esther Dyson to speak. Turns out, yes, he had heard of Esther – in fact she is one of his advisors. What a great coincidence. We sat together at lunch and on my other side was Sri P. Srivastava, founder of Clintech Research. I’d interviewed him for U.S. 1 but we’d never met, and he was eager to tell (and I was eager to hear of his success). 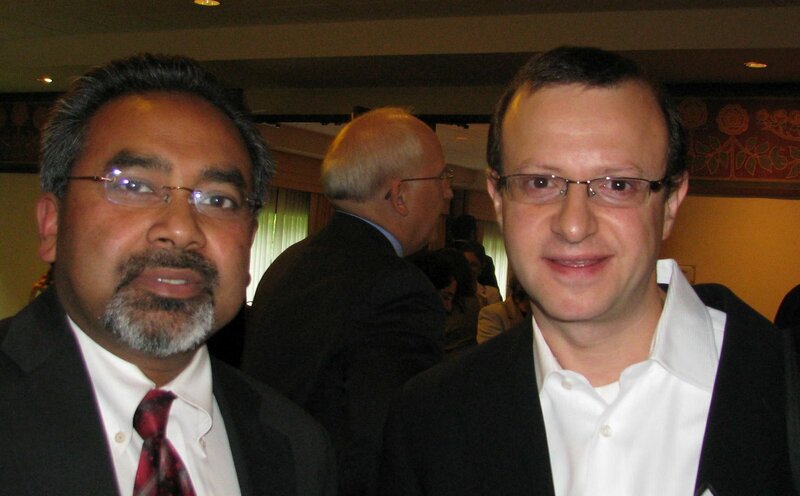 In the photo above, Srivastava is on the left, Kogan on the right. I snapped some candids that may help jog memories. Here is the link to the photos. (E-mail me or comment if you don’t want your photo or name used or if you weren’t IDed and want to be). Loren D. Danzis of Delaware Crossing Investor Group. Joan Zief of Golden Seeds (female entrepreneurs). Mario M. Casabona and Katherine O’Neill of JumpStart NJ Angel Network (mostly, but not all, in NJ, uses http://www.angelsoft.net for applications). Christopher Starr of Mid-Atlantic Angel Group Funds. Ellen Sandles of Tri-State Private Investors Network, the longest running and the only one who will “do” retail. Other gleanings: If you meet one angel, you can connect with several, because they work together. A good place to meet them is at private airports, because — as risk takers — they are often pilots. If your business requires execution, don’t apply for angel money until you have some sales. And the oldie but goodie, angels invest where others fear to tread.